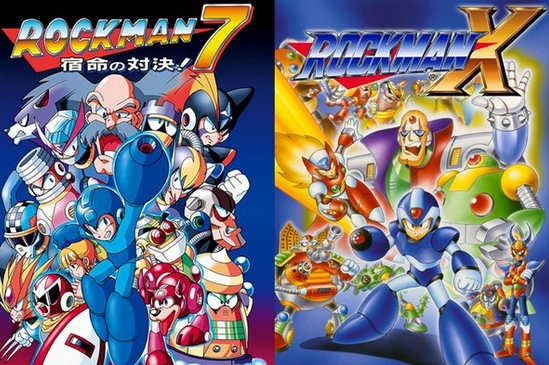 Today, New Nintendo 3DS* owners in Japan can grab Rockman X and Rockman 7 for 823 yen a piece (about $8.00) from the eShop. If you live in North America or Europe, stay tuned. No word yet on availability outside Japan, but it's expected. Hopefully we'll have news to share sooner than later. *SNES/SFC emulation is exclusive to New 3DS models; incompatible on OG 3DS/XL systems. It's a Virtual Console game, so no 3D. Is it only on the N3DS, or is that just the term used to ID all types of 3DS systems? Cause f that for the former... and people complain about PS4K. Laaame.... Seriously, I would think that the original 3DS hardware is powerful enough to emulate a SNES game. So why on earth is Nintendo limiting SNES VC games to only the New 3DS? It's not like anyone is going to buy a New 3DS just to play SNES games, right? The psp and the og 3ds have around the same specs, the 3ds being "much" better. The psp could emulate most snes games at full speed but only because of all the speed hacks being used. They were also not accurately emulated at all. Nintendo is all about authenticity and with the N3ds being 2-3 times more powerful (333 mhz compared to about 900 mhz among other enhancements) it's able to to be emulated up to Nintendo's standards. It's (N3DSXL) literally nearly double (nowhere near triple) the CPU processing, VRAM, RAM of the 3DSXL the GPU is relatively similar in stats. As for PSP it is way less powerful than the original 3DS, especially since the 3DS has a relatively powerful core processors dedicated to its OS. Although VITA blows all these away, shame on developers fro not utilizing this beautiful machine more. You know what's funny about the PSP, though? It has (homebrew) emulators that can run Super NES games (among other systems) at full speed perfectly fine. Granted, you have to make sure the clock speed is running at its maximum potential (333MHz instead of the usual 166-233MHz), but still. The fact of the matter is, for the accuracy Nintendo wants/needs for the SNES games, the original 3DS simply can't run them. A person who worked on BlargSNES(an emulator on 3DS) started that while it did run most games at 60fps on the Old 3DS, it would never be able to run them all. And the games that it did run, some of them had graphical glitches. This is because Blarg users hardware rendering. It ends up having inaccurate clock rates, and renders sprites and tiles as polygons, which can cause graphical glitches. Nintendo is using software rendering, which is way more accurate. Unfortunately, for the power it needs to run games at full speed, the old 3DS simply doesn't have enough of it. The new 3DS does have the power, though. If you search online for SNES VC on old 3DS, you'll find examples of a new 3DS clocked down to an old 3DS' engine speed first(using a custom firmware hack), then running the VC game afterward. It ends up running at, maybe, less than half the speed it should. Would you rather have speedy, yet glitchy SNES games, or extremely accurate ones? I played through Mega Man X3 on ZSNES before it could even render the Cx4 chip or proper translucency. I would love to have 7 on the go, between 7 and 3, it might just be my favorite game in the series. Not about to buy that "new 3ds" though.